It’s the height of summer, so why look back at the unfolding of a prior season? Based on the frequently-banned 1891 play by Frank Wedekind, the 2006 musical is (tragically) as fresh and relevant as ever. The issues that were so provocative and controversial 130 years ago are still very much with us: physical and sexual abuse of young people; teen suicide; teen pregnancy; forced abortions. The genius of the show is that composer Duncan Sheik and lyricist Steven Sater set the play in a rigid 19th century Germany, but gave it a thumping, heart-rending rock score. And instead of the songs delineating character or forwarding the action, these raw and poetic numbers are internal monologues, as these adolescents grapple with self-discovery and self-identity. Teri Brown is the imaginative and risk-taking artistic director of OnStage. “Spring Awakening” comes close on the heels of another contentious teen show: “Heathers, The Musical,” which disturbed some of her patrons but was a huge sellout, twice extended. 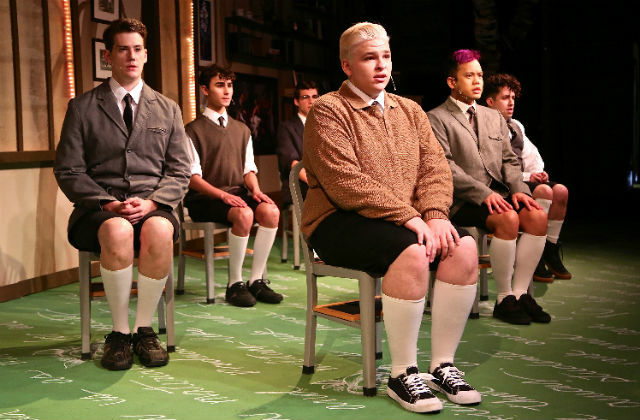 Fortunately for you, “Spring Awakening” has been extended, too (through August 19), so you still have time to catch this detailed, deeply etched production. The set (created by Chad Oakley, who also designed the moody lighting) is at once a church, school and home, with chalkboard-green floor, clerestory windows, two large “trees of knowledge,” made entirely of books, and photos of Germans past, paintings of mythological figures (the image of Achilles and Patroclus is especially apt), adroitly-employed ladders and some pertinent scenes painted by multi-talented cast members. The band is, as Teri describes it, “five guys playing 13 instruments” assisted by two laptops. A cello is crucial to the haunting, mournful score, and while there isn’t a living cellist in attendance, Teri purchased a special app that would make an electronic cello not sound electronic. (It worked). The resulting band is excellent, and in this small space, it wondrously does not drown out the singers. Which brings us to the cast. The voices are exemplary, the harmonies superb. The three central leads Peter Armado, Seejay Lewis and Truly Bailey), who play Melchior (the Idealist), Moritz (the Misfit) and Wendla (the Innocent), respectively, are all strong. But Lewis is a knockout, with his wild hair, edgy, neurotic excitability and extreme vocal range. Sara Ah Sing is also a standout, as Ilse, the runaway, as is Kaitlyn Summers as Martha, a girl abused by her father. Alex Dunbar also bears mentioning as the gay manipulator, Hanschen. Rebecca Miller and Anthony Donovan play all the (mostly heinous) adults with aplomb. Brown’s meticulous direction melds inextricably with Patrick Mayuyu’s exciting choreography, featuring sharp, often stylized movements. The storytelling is made crystal clear, which isn’t always the case with this vocally and thematically challenging show. The commitment of the cast is palpable. These actors, ranging in age from 17 to 26, aren’t that far from the anxiety and angst of high schoolers trying to understand their changing bodies, their uncontrollable thoughts and desires, the doctrinaire doctrines of the church, their increasingly fraught and distant relationships with their parents and teachers, and their own place in the world. The teen years, as we all know, are a trying time for all. Not everyone makes it out intact or alive. The harsh realities and ultimately, the searing hopefulness of “Spring Awakening” make it a must-see for anyone over 18 (the recommended audience age for this production). I dare you not to be moved or touched. Performances are Thursday-Saturday at 8 p.m. and Sunday at 2 p.m.